Today was 112°F here in Las Vegas, and I felt like I was melting even INDOORS with air conditioning. I saw a wonderful gradient on Michelle of All Lacquered Up's blog. She used one off the butterLONDON jellies layered 4 times to create a pretty effect. I loved the effect of the jelly layering so much, I decided to do my own- I used a polish that took about 5 layers to be opaque, and I think it worked perfectly for this effect. I used Nicole by OPI Respect the World Matte as a base, with Confetti My Favorite Martian sponged over it in three layers. Topped it all off with 2 coats of Seche Vite top coat. This is wonderful looking. Apparently simple, but very attractive. I think I'll try it too. Wow, that's gorgeous! I also loved that manicure of All Lacquered Up, so I definitely need to try this! It reminds me of gras and a blue sky, lovely! Gorgeous! 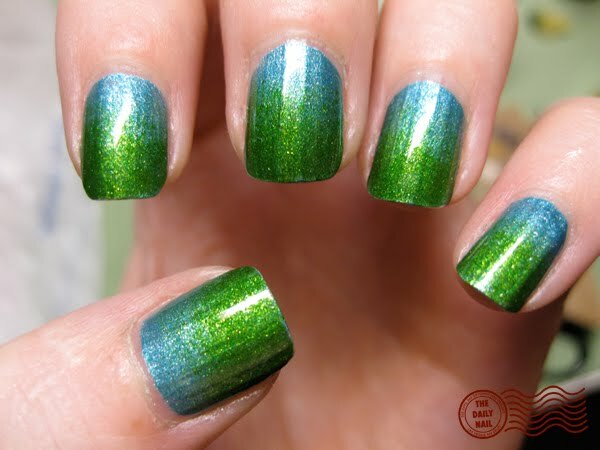 I really need to try a gradient mani--I also loved the ALU one. I'm in Vegas, too, and it WAS hot... But we were blasting the air conditioner, so it was all good! LOVE the nails. They're so pretty!!! Oh gosh, you did such a wonderful job! I wish my gradient attempt turned out this great! That is so, so gorgeous! I have been really loving gradients lately. I think the jelly polishes give it lot more depth than the way I've been doing them! Still... gradients are gorgeous no matter what! I love these colours for summer! Saw Michelle's yesterday, and I am loving your version also!! Hot here, too!! I am so done with Summer. Great gradient. Gorgeous - I'm partial to these colors.